When I started writing Gay Iconography in late 2013, I hoped to explore why some celebrities and artists held mass appeal — not to be confused with universal appeal, mind you — within the gay community. Over time, what began as a light-hearted feature celebrating these stars with a few YouTube clips became a lightning rod of conversation and, shall we say, spirited debate. The original premise, as stated in the early posts, was to “present a proposed iconic figure or character and then ask you to weigh in with your thoughts.” The second half of the stated mission — asking you to weigh in with your thoughts — is what’s made it most interesting for me. This year, the first full calendar year of the column, Gay Iconography has received more than 1,300 comments (and, yes, I read them all). I thought it would be interesting to look back at lessons learned from these conversations and see if we’re any closer to recognizing what draws some of us to these cultural cornerstones. The conversation may not have always been nuanced (and, of course, it did occasionally devolve into name-calling and flamewars like any comments section on the Internet), but there have been some surprising revelations. 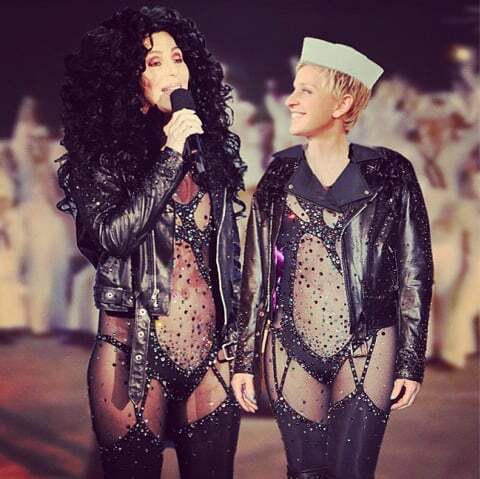 For example, while I had expected some controversial choices like Queen Latifah and Donna Summer to be met with criticism, and I could have anticipated younger picks like Robyn or Frank Ocean to be easily dismissed, I was still surprised to see people deny the impact of, say, Cher, Madonna or Dolly Parton. There’s always room to debate the merits of any one individual, but it seemed at times as if some folks aimed to refute the existence of a unique LGBT culture to represent at all. One of the more common (and at times troubling) ideas that pops up in the comments of these posts is the idea that the gay icon mantle should be reserved for gay men. On the Cyndi Lauper post, Roger wrote: “Where are our male icons? Female icons ultimately serve the interests of women more than they do us guys. We need male icons.” It was a sentiment echoed by Rable on a post about Anderson Cooper (“Finally, someone this site decides is a ‘gay icon’ that is actually part of our community. Straight women are not ‘gay icons.’”) and by Tyler on our post about Jonathan Groff (“Wow, an actual gay man suggested as a possible gay icon. Not a heterosexual female. Not a fake trans female. But an actual bona fide gay dude. Progress!”). For reference, in 2014, we featured 27 posts focused on women, 23 on men. In terms of sexuality, 28 have identified as LGBT. It’s not enough to just be gay, however. There is also an expectation of significant contribution to the gay community. Commenter Tigernan summed it up with their thoughts on Neil Patrick Harris: “If you're going to be a gay icon, I think you need to have done something for us than just exist. So far Neil has come out and…that's it. I'm not slamming him, I'm just saying that we appear to be willing to give accolades to people simply for admitting that they are gay. No thank you – charity work, artistic contribution, or heroism: otherwise you are just a gay person who a lot of people like.” Even vocal LGBT supporter Dolly Parton is held to a higher standard by Petey, whom said “Saying things is not the same as doing things. A true gay icon should have the balls to support full equality for homosexual men by marching alongside them and holding a banner. PR statements aren't enough.” It’s an interesting notion. While younger, contemporary stars like Lady Gaga have championed LGBT rights, is it fair to expect the same from the stars of the ’50s, ‘60s, ‘70s, etc.? Whom do you consider an icon?